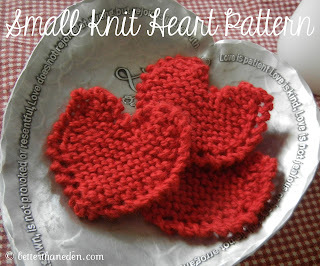 I was looking for a pattern for a small knit heart to create a garland for St. Valentine's feast but couldn't find one I could understand or that would make the kind of heart I wanted. SOOO...I figured it out on my own :) Finished, this heart measures three inches tall by three and a half inches wide and each one takes only about 5 minutes to make. These could be used for a garland, sachets, stuffed, or any number of little projects. The pattern looks long but is very simple...I just prefer patterns I read to be very clear. You are free to use this but please link back to this site if you publish or share anything about it and please keep my copyright in place. Thank you! Be sure to maintain the same tension and not knit too tightly. Otherwise, you'll get a curly heart. Thread yarn through remaining 2 stitches and weave in. Weave in all ends. Block if desired. The hearts I made were 3" tall by 3 1/2" wide. To make a garland, simply make as many hearts as desired, then thread them using the length of yarn you desire. You could also knit an I-cord or crochet a chain but I preferred the simplicity and thickness of the plain yarn. Weave through the tops of each heart wherever you would like them placed! Enjoy!